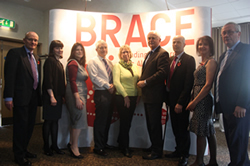 Today I have been involved in a mini-conference arranged by BRACE, ‘Dementia: Hope for the Future’. The event, which I was involved in planning, was chaired by former ITN and BBC newsreader Martyn Lewis. After Mark Poarch and Martyn Lewis introduced the day, I gave a presentation to provide the audience with an overview of significant news within the world of dementia, before moving on to interview Chris Roberts (who is living with dementia), Jayne Goodrick (Chris’s wife) and Mike Hennessey (Service Director, Bristol City Council). After that session, Liz Coulthard gave an overview of research and scientific developments, and local GP, Peter Bagshaw, spoke about issues in Primary Care. 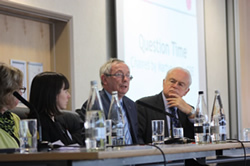 The event was concluded by a Question Time style panel debate with Mike Hennessey, Liz Coulthard, Peter Bagshaw, Hilary Doxford (who is living with dementia), Tony Hall (Chairman of Bristol Dementia Action Alliance and carer to his wife) and myself, with questions fielded by Martyn Lewis. 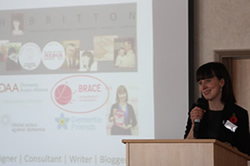 I am hugely grateful to everyone who supported this event, to BRACE for hosting it, to the James Tudor Foundation for their sponsorship, and to my fellow speakers – it was an honour to share the platform with you. I would also like to extend a special thank you to Chris, Jayne and Mike who were fantastically insightful interviewees.